On September 22, 105 The Bashar Al Assad's government in Syria, confirmed the import of sophisticated military hardware and fighter jets from Russia — just as fresh satellite images purported to show the construction of two new Russian military bases in the northwest of the country, near the port of Latakia. 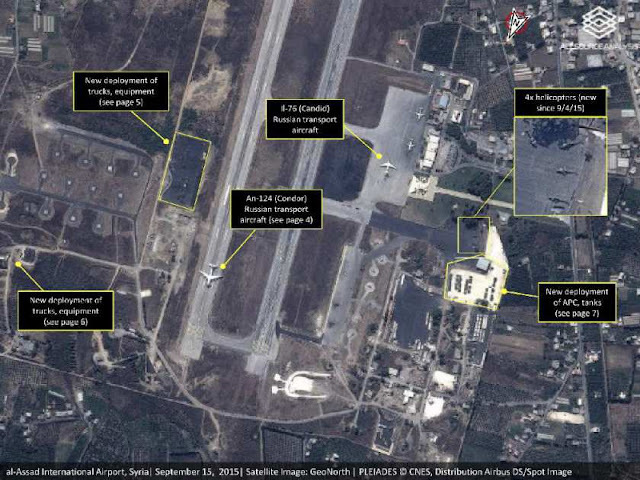 The Russian build-up is mostly centered on the Mediterranean port city's international airport, to the south, where dozens of warplanes and attack helicopters have arrived in recent weeks. 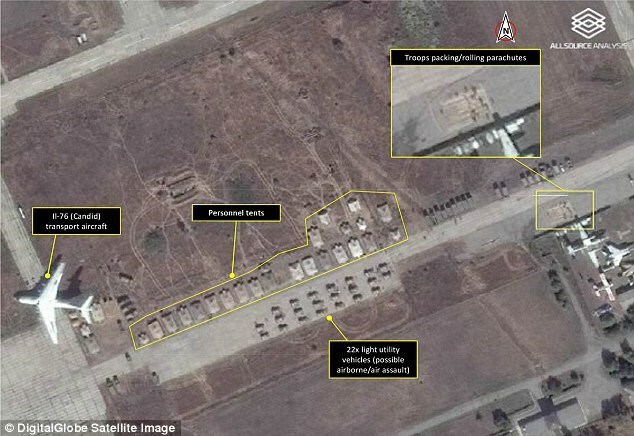 Tanks, anti-aircraft systems, drones and 200 marines have also reportedly been sent, along with housing for up to 2,000 personnel. 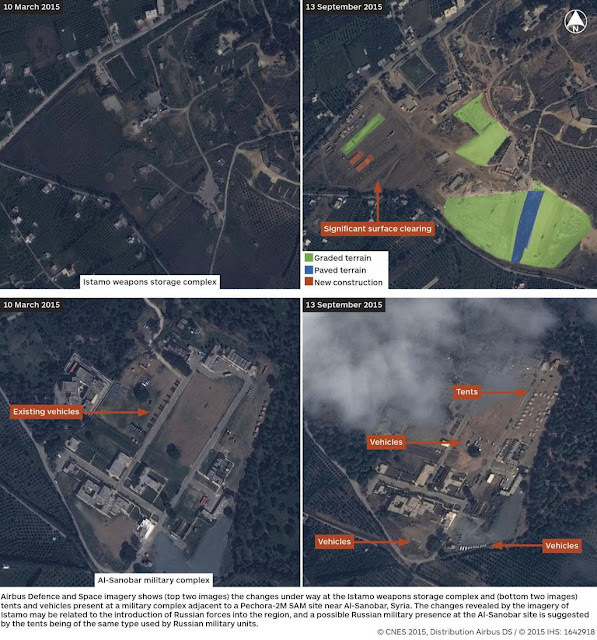 But the new satellite images from mid-September, published by defence research group IHS Jane's, appear to show preparations are under way to receive Russian forces at the Istamo weapons depot and the al-Sanobar military complex. 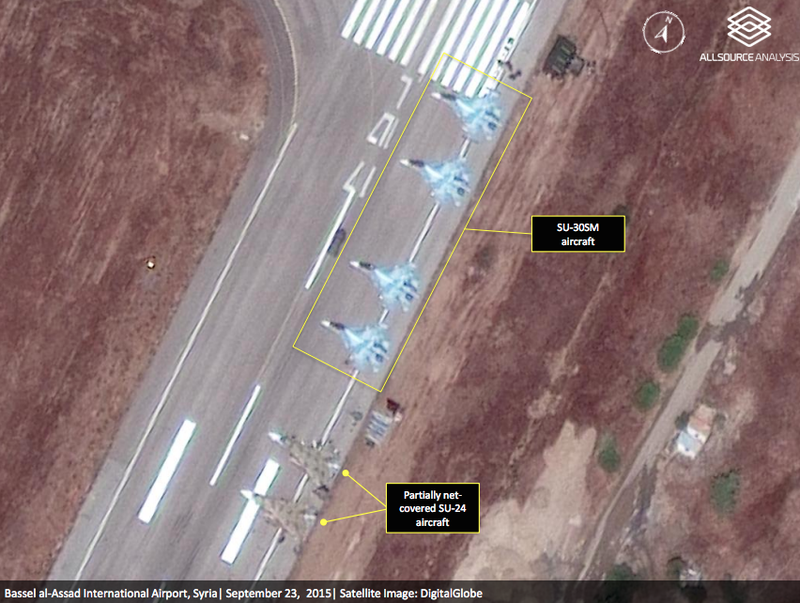 The arrival of the Russian warplanes raised concerns that Moscow was preparing to intervene directly to shore up President Assad, whose forces have suffered a series of defeats to rebel forces and jihadist militants from Islamic State (IS) this year. 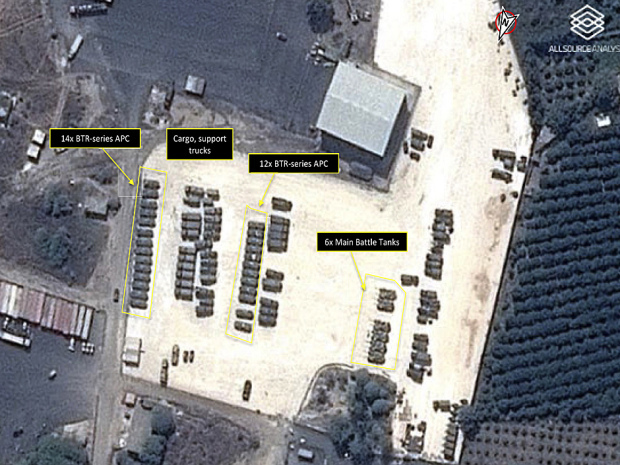 What is clearly visible is that a sizable air expeditionary force has been sent to the airbase at Latakia, including about 24 ground-attack Su-24 aircraft and a small number of multi-role Su-27 fighters. There are attack helicopters too and drones, along with the various additional ground elements needed to defend the base against attack. The deployment, anticipated by an air bridge from Russia that involved several An-124 Condor airlifter flights (that we were able to track thanks to their Mode-S transponders) saw the aircraft arrive at al-Assad International Airport, near Latakia, the main Syrian port city, on Sept. 18.